For this third edition, there are three groups from overseas. “SD AL Ikhlas Jakarta” from Indonesia, “Bunun” Cultural and Educational Foundation from Taiwan and “Skazka” dance group from Russia. Local groups include the “Hakodate Shonen Shoujo Gasshoudan” chorus group, and a special appearance by the young-at-heart Hinokiya. (Russia), Hakodate Shonen Shoujo Gasshoudan, "Honorary Kids For The Day" Hinokiya and more. 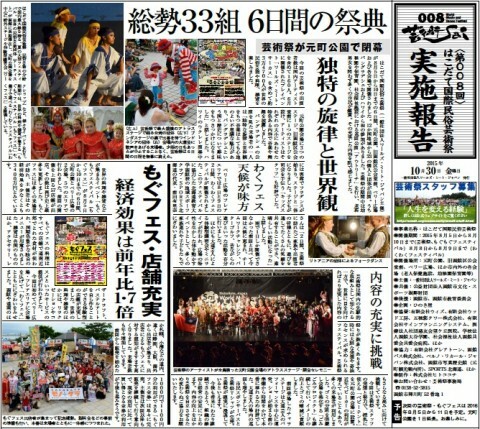 After the success of the 2015 WMDF (edition 008), we sent a newspaper-style report to all staff, sponsors and others involved in the production of WMDF and of our co-located events, the Mogu Mogu (goods and gourmet) festival and the Waku Waku (physical activity) festival. We would love to also send this to all our 35,000 audience, but since we can’t, here is your chance to download. It is Japanese-only (a 3.5M pdf file), but hey it has lots of cool pictures. We are already well advanced in the preparations for WMDF 009, and there are lots of great new performers planning their paths across the globe to meet in Hakodate this August. For 2016, we will run for seven days for the first time, to take advantage of the new national holiday on Aug 11. 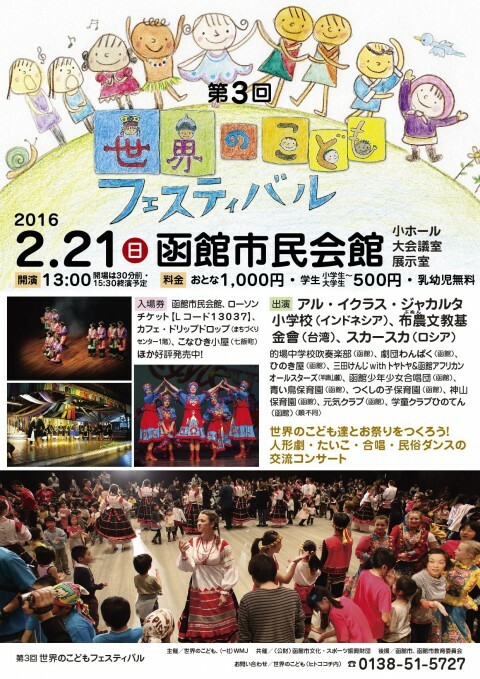 What better way to celebrate “Mountain Day” than to join us in Motomachi Park on the slopes of the town’s renowned Hakodate Yama?